The conventional wisdom around healthy food shopping has trained us to scan ingredient labels for trans fats, added sugar and hard-to-pronounce additives. While trans fats and sugars are definitely best left on the shelf, you might be surprised to learn that additives aren't always bad news. 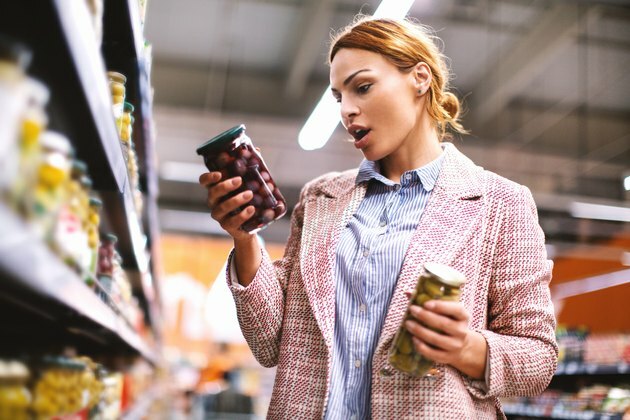 "Food additives preserve foods so they are safe to store and eat later," says Debbie Petitpain, a Sodexo Wellness dietitian based in South Carolina. "They also help retain color, texture, flavor and nutrition, and they are regulated by the FDA and tested for safety before hitting the market." And while some modern food additives aren't good for you — like sodium added to infuse processed foods with more flavor — those "unpronounceable" ingredients don't have to be harmful. In some cases, they may even be good for you! Tocopherols might be difficult to pronounce (it's "toh-KOH-fur-oles," by the way), but they're actually beneficial. "Tocopherol is essentially vitamin E, used as a preservative to prevent the oils and fats in a product from going rancid," says Brenna Thompson, registered dietician at Nutritional Weight & Wellness. So you'll often see them in oily foods like salad dressings that need to have a relatively long shelf life. Your body actually needs vitamin E, and tocopherols protect your fat cells from free radical damage, says Thompson. That's important to your overall health, since free-radical damage causes cellular aging and has the potential to cause diseases, including cancer. "Locust" doesn't exactly sound like a delicious food to include in your diet, but locust bean gum actually comes from a familiar plant — the carob tree. "Locust bean gum comes from the seeds of a carob tree and is used as a thickener in foods like yogurt and cream cheese," says Thompson. It also adds a chocolaty flavor to foods — perfect for indulging a craving healthfully. Consuming locust bean gum may help manage your cholesterol levels, protect your heart and help stabilize your blood sugar levels, says Thompson. If you've ever enjoyed luxuriously creamy yogurt or pudding that's "magically" low in fat, you may have xanthan gum to thank. As a thickener, xanthan gum can act as the "glue" to improve the texture of gluten-free foods, making it your new best friend if you grapple with celiac disease or gluten intolerance. It's also relatively harmless, says Thompson. "Some people with very sensitive digestive systems may experience digestive issues, but in general, it is extremely safe to use." Pyridoxine hydrochloride probably sounds pretty foreign to your ears, but you already know this additive under a different name: vitamin B-6. Your body needs the essential vitamin B-6 to function properly, and it does a lot for your health. "Pyridoxine helps to maintain blood glucose levels and supports immune system function," says registered dietitian Kim Melton. "It also assists in proper functioning of your nervous system and your red blood cells." You'll most often find pyridoxine hydrochloride in bread, cereal and other grain-based products; food manufacturers add it in to make the food more nutritious. And you'll also find B-6 naturally in vegetables, eggs and meat. Calcium pantothenate manages to pack two essential nutrients into one additive, and while it contains calcium (duh! ), food manufacturers actually value it for the pantothenate, more commonly known as vitamin B-5. Vitamin B-5 is crucial for a healthy metabolism, and it helps you break down fatty acids, carbohydrates and protein in your food, says Melton. It also helps synthesize cholesterol, fats, certain hormones and hemoglobin, the protein that helps your red blood cells transport oxygen. Like pyridoxine hydrochloride, you'll find calcium pantothenate added to cereals, breads and similar products. You can also get B-5 naturally via egg yolks, whole grains, seeds and nuts. Just the sight of an ingredient as long as docosahexaenoic acid (do-COS-sa-hex-a-NO-ic) might scare you away from a food. But it shouldn't: Docosahexaenoic acid, also called DHA, is actually a very healthy form of omega-3 fatty acid. "DHA plays a major role in the structure of the brain, skin and the retina of your eye," says Melton. "It also decreases inflammation, which helps to fight diseases such as cardiovascular disease and cancer." You'll mainly find DHA listed as an ingredient in fish or algae oils, but you may also see it in other omega-3-fortified foods, including omega-3 eggs. You've probably felt the lactic acid burn in your glutes when you're pushing through those last few squats — but what is its purpose as a food additive? "Lactic acid is added to control acidity of foods," says registered dietitian nutritionist Jennifer Cohen Katz. "It's used in the fermentation process of vegetables and other foods. It's also added to prevent foods from spoiling or to contribute a tart flavor to desserts and beverages." Lactic acid doesn't have any particular health benefits when consumed, but it's not bad for you either. It's also found naturally in your digestive tract, says Katz. Those high-fiber granola bars, cereals and other goodies often owe most (or all) of their fiber content to one food additive — inulin. Extracted from chicory root, inulin is a source of fiber that can also be substituted for fat in foods, says Katz. "Inulin encourages the growth of beneficial bacteria in the digestive system," she says. "And it doesn't raise blood sugar levels, so it's useful in the diet of those with diabetes or those trying to control their weight." So while inulin can't replace the naturally occurring fiber in your diet — you'll still need fruits, veggies, whole grains, nuts and seeds for that — it does mean inulin-containing foods have some added benefits. If you're trying to avoid high-fat packaged and processed foods, opting for goods with glycerol may help. Glycerol makes up part of the chemical structure of fats, but it doesn't contain fatty acids — the long chains of fat that supply the most calories. Instead, glycerol simply infuses your food with more moisture, says Katz, making it a good substitute for oil in foods, and also helps thicken liquids to give your food a more luxurious texture — again, without all the calories of added fats. And while the health benefits of glycerol require further investigation, some evidence suggests it might improve your athletic performance, making glycerol-containing foods potentially helpful for powering through tough workouts. Ferrous gluconate doesn't sound too friendly, but it's actually a source of iron, a nutrient that many of us sorely need more of. Food manufacturers actually rely on ferrous gluconate to help improve the nutritional value of the food, since iron is crucial for energy production, immune function and supplying your brain, muscles and other tissues with oxygen. It can also be used to improve the appearance of some foods. For example, it helps give black olives their deep black color, says Katz. Plenty of foods, from breads to oatmeal to some varieties of orange juice, can come fortified with iron, so you'll likely spot it on the labels of a range of healthy foods. And, of course, you can also naturally boost your iron intake by eating lean beef, eggs, spinach and lentils. "1,25 dihydroxycholicalciferol is horrid-sounding, but you'd die without it. Most people have a dietary deficiency of it," says registered dietitian Keith-Thomas Ayoob. The reason? "It's vitamin D." Food manufacturers are actually required to add vitamin D to dairy, since you need vitamin D to properly absorb calcium. As a result, vitamin D is essential for healthy bones, and emercing evidence suggests that vitamin D is also important for heart health, immune function and even regulating your hormone levels. In addition to dairy, you might find 1,25 dihydroxycholicalciferol added to orange juice and alternative milks like almond milk. Glutamate gets a bad nutritional wrap because it's often attached to sodium — as MSG, or monosodium glutamate — but it's not actually bad for you, says Ayoob. While MSG has been a source of controversy for years, its reputation for causing adverse reactions has been largely disproved. As a nonessential amino acid, your body already produces lots of glutamate, and you'll also get it from virtually any protein-containing food. There's even some evidence that glutamate plays a role in controlling your appetite, with animal studies showing it has the potential to prevent weight gain. As an additive, it adds umami, infusing your food with more flavor without adding sugar or fat. Potassium sorbate is used almost ubiquitously in food manufacturing, and it's even added to dietary supplements — so it's a good thing that it isn't not bad for you! "Potassium sorbate helps prevent spoilage," says Ayoob. "It's naturally found in some cheeses, but it can be added to foods like yogurt to prevent spoilage." It's also often used to prolong the shelf life of dried fruits, and it's neutral flavor means that iron-packed handful of raisins will stay fresh without any "chemical" aftertaste. Potassium sorbate doesn't offer any specific health benefits — after all, it's used in minute amounts — but it won't have any adverse effects, either. Even if ascorbic acid sounds unfamiliar, you undoubtedly know it by its other name: vitamin C. Vitamin C is a powerful antioxidant, so eating foods rich in it helps safeguard your cells against damage from free radicals. Those same antioxidant benefits make it a good food additive, since vitamin C can combat spoilage to improve shelf life and maintain the foods color, flavor and texture. Manufacturers also use it to improve the nutritional value of food, and in fruit- and veggie-based foods it's used to replace the vitamin C lost during manufacturing. As far as health benefits, vitamin C is also crucial for a healthy immune system, says registered dietitian Mandy Enright. Eat vegetarian or vegan? You've likely run into agar, an additive derived from seaweed. "Agar is often used as a vegetarian substitute for gelatin and as a thickener for soups, jams and ice cream," says Enright. "It's found in puddings, bakery fillings, jelly candies and jellies, jams and marmalades." The additive is safe for human consumption, she says. And there's some preliminary evidence that it might keep you full for longer after you've eaten, though more research is needed to understand how much it might help with weight loss. Soy has developed a (mostly undeserved) bad health reputation, so it's no surprise that "soy lecithin" on the label might sound unhealthy. But lecithin is actually a great natural source of choline, a nutrient your body needs to thrive. "Choline is needed to keep cells healthy and produce signals that travel to the brain, muscles and other functions of the nervous system," says Enright. "And while we do make some choline in our liver, it's not enough to meet our needs." Lecithin is primarily used as an emulsifier, which means it helps keep foods mixtures combined and uniform — so your almond milk, for example, stays rich and milky instead of settling into a grainy mess at the bottom of the carton. It can also help improve the texture of dressings, yogurts and sauces without adding fat, so you can enjoy richer foods minus some of the calories. Now you know vitamin C goes by another name — ascorbic acid — but you'll also find it in your foods listed as ascorbyl palmitate. This form of vitamin C comes attached to a fat (palmitic acid), which allows the vitamin C to dissolve in the oil in your food. Once dissolved, vitamin C offers antioxidant benefits that keep the oil from going rancid, improving shelf life, says naturopathic doctor Andrea Maxim. And while added fat in your food probably doesn't sound appealing, palmitic acid is added in such small amounts that it won't affect your cholesterol, says Maxim. And as for the extra vitamin C? Any vitamin you don't need gets released via your urine. Acetic acid might not sound very familiar, but it's actually one of the oldest food preservatives in the world: vinegar. "Vinegar provides the bite of a pickle or vinaigrette and is a common ingredient in condiments like ketchup and mustard," says Petitpain. "Because it increases the acidity of a food, which inhibits bacterial growth, it acts as a preservative and extends shelf life, making pickles available long after cucumber season is over." Acetic acid also has some health benefits, including the ability to help regulate your blood sugar after a meal — a must if you have diabetes or simply want to avoid the hunger pangs linked to rapid blood sugar fluctuations. You might find EDTA listed on nutrition labels in its abbreviated form or under its full name, ethylenediaminetetraacetic acid. (Try to say that five times fast!) And while it's certainly a bit of a mouthful, EDTA doesn't pose any risk to your health. "EDTA is added to many foods to promote the color, texture or flavor of a food," says Petitpain. "It promotes color retention in canned beans, retains flavor in carbonated soft drinks and stabilizes mixtures that contain oil, such as mayonnaise, so they don't separate. It also gathers charged metal particles, a process called chelating, to prevent them from oxidizing or spoiling food." Even if you don't recognize the name, you've likely already had tartaric acid in some form today, since it's found in wine, grapes and baking powder. "Tartaric acid is added to foods for the tangy flavor or to prevent spoilage by bacteria," says Petitpain. "And baking soda and is used as a leavening agent, making baked goods light and fluffy." The science-backed benefits of tartaric acid are still under investigation, but some cultures claim it improves gut function and boosts the immune system, she says.